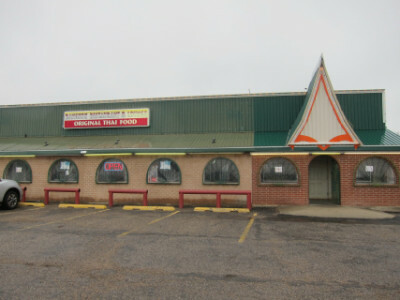 Bangkok is one of several Southeast Asian restaurants along the old Route 66 in Amarillo that have become some of my favorite places to stop when I am passing through. I not only like the Thai and Lao food served at the multiple restaurants within a 5 or 6 block strip, but it seems that something will always be open late at night (Bangkok is open until 11:30 p.m.), and many of them are open holidays such as Christmas (I am not sure about Bangkok in this regard). I have not even come to the point that I have a favorite among these restaurants–I just know that I have had good meals at all of them. My first visit to Bangkok was in about 2005, and it immediately impressed me with two things–the good food and the fact that there was no smoke. I do not know if in fact it is a non-smoking restaurant because in Amarillo each restaurant can make its own choice, but I just know that I have not experienced anyone smoking in my three visits there. If I am mistaken about their smoking policy I will say that the dining room is large enough that you could stay away from the smoke (if there is any). Probably the thing that would be of concern to most people, though, is the fact that it is cash only (they do not take checks or credit cards). The prices are so cheap, though, it makes me think this is how it could be at all restaurants if they stopped taking credit cards. From the old and new menus I have picked up, I noticed that some new dishes have been added but there have been minimal price increases on the old ones. The “kaprao” dish I ordered in 2019 appears to be a little smaller than a similar “krapao” dish I had in 2009 (so perhaps they have reduced the portion size a little bit). I am not saying this to discourage anyone, but on the contrary I found that you still get good servings at very good prices. Plates are still very filling even if they are smaller than before (and I do not know if this is the case). In any case, you get a very good portion of rice with the plate, and this is not the case at all Thai restaurants. Chicken Kaprao is a very flavorful and somewhat spicy dish that is so good it makes it hard to try anything else on the menu (I ordered the “krapao” on an earlier visit). Pad kra pao is actually the translation for holy basil, one of its main flavor components but one which was not mentioned on the menu. Instead, the following were mentioned or were items that I saw in the dish: green beans, Thai eggplant, and green, red, and orange chiles. I should mention that the spice level you would like in the food is what you should order. The spice level is not adjusted for American tastes–the one here is the real deal. They gave me some chiles on the side but I ended up not using them (this was my insurance in case the food was not spicy enough, but the extra spice was not necessary). My dining companion ordered Chicken Panang, and we shared the dishes. I liked this because I got to sample one of Bangkok’s curry dishes and to be able to say that it was excellent as well. When I visited in 2009 I also ordered the chicken “Krapao” which visually looks a little different from the current dish but I believe it is the same thing. The chicken was ground (now I believe the pieces are a little larger). 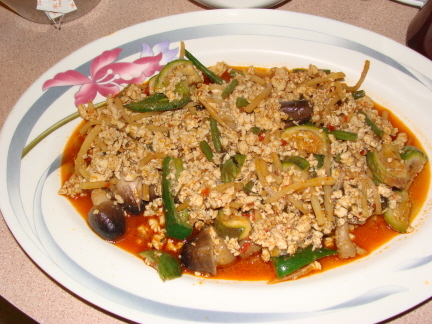 I noted that this one had eggplant, bamboo, and green beans (I believe the current one has the same ingredients). Both the old and new one had mushrooms. I did not notice the red and orange chiles in the old version but perhaps they were there. 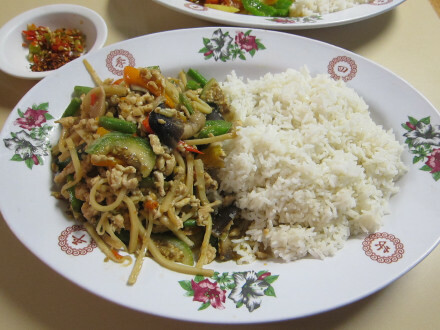 In any case, this was essentially the same dish with the rice served on a separate plate (rather than now when the main dish and rice are on the same plate). From an even earlier visit I noted that the Chicken Soup was very good (I do not have photos of it). It came in a large bowl, almost big enough for a meal, (and comes in an even larger bowl if you want it). The broth was almost clear, with lemongrass, ginger, and other herbs mixed in for a flavorful base to the very good white meat chicken. Small mushrooms were the only vegetable included. I am not sure the amount of food in the smaller bowl would be enough to make a satisfying meal for the average person, but the flavor was more than satisfying (I ate it as an appetizer). The current menu lists both a chicken soup and chicken coconut soup (I believe the former is what I got). This is very much a home style restaurant where you feel that you are sharing a family’s meal. I also feel this way because of the absence of overly-sweet curries and things that some restaurants do to try to adjust their food to American tastes. 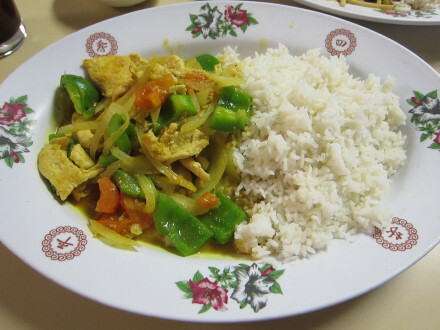 Here you get a Thai taste, although they will of course adjust the spiciness level and anything else you need because of dietary restrictions, etc. The thing that is difficult about the menu is that it lists items such as “chicken soup,” without telling you that this is a very complex chicken soup with Asian flavors which include lemongrass, etc. I have observed many customers come in who seem to be regulars, and know what dishes they like. I do not think there would be anything here that I do not like, but of course when I come to a place that cooks in the real Thai style I like to take advantage of it as much as possible. The kaprao dish is something I like to order here because I cannot find it at a lot of Thai restaurants, and certainly few dishes that are as good as the one here. Nevertheless, if you feel like getting something simple (such as chicken soup) I would say that if you are in the mood for it, it can be equally satisfying. This entry was posted in Texas by Steve. Bookmark the permalink.